The Philips HeartStart FRx Defibrillator is designed to be easy to set up and use, as well as rugged and reliable for those who get there first. On the scene with law enforcement, on the field with student athletes, or on the job with employees, the FRx Defibrillator treats sudden cardiac arrest (SCA) in environments and conditions too demanding for other defibrillators. The publishers of MEDIC First Aid and ASHI training programs now introduce the First Safety Institute (FSI) series for OSHA compliance training. FSI combines video-based, instructor-facilitated training with online delivery options to create an engaging learning experience. Inaugural programs include portable fire extinguishers, PPE, and respiratory protection. 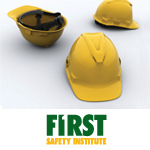 Health & Safety Institute — your single-source provider for health and safety training. The LIFE®StartSystem weighs 8 pounds, measures 12”x12”x13”, and is durable/water resistant. 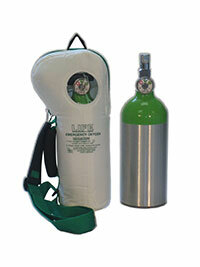 It comes complete with LIFE-O2® 6&12 LPM "NORM" & "HIGH" regulator, which provides 15+ minute supply of emergency oxygen. The aluminum cylinder is disposable/replaceable (or refillable). The LIFE® CPR Mask universally fits Adult & Child and is intended for first-aid emergency oxygen administration and, if needed before fibrillation or after successful defibrillation. (Purchase Philips OnSite/FRx AED separately) Patented. Distributor Inquires Welcomed! 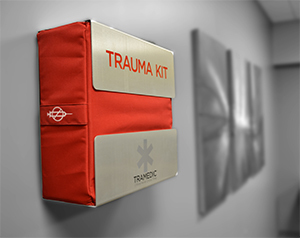 Tramedic™ trauma kits have been installed throughout the city of Dallas, Texas, to prepare their community in the event of an emergency situation that leads to traumatic injuries. These emergency situations include everything from active shooters and natural disasters to car accidents and workplace injuries. Dallas’ kits will be placed in the lobbies of city-owned buildings, and 13,000 city officials will be trained on their Tramedic™ kits in the coming weeks. City officials have demonstrated the lifesaving impact that these trauma kits can have. Dr. Alex Eastman, the medical director and chief surgeon at Parkland’s Rees-Jones Trauma Center and longtime member of the Dallas SWAT Team, led the demonstration of these kits. Eastman said, “This citywide implementation is part of the national Stop the Bleed Campaign, which was launched by The White House in 2015.” Stop the Bleed aims to empower civilians with the knowledge and tools to treat those critically injured until professional responders can arrive. These kits are designed to be used by all levels of responders, including the untrained bystander, so that anyone can provide immediate care. Simple and color-coded instructions lead the user to the proper equipment to treat not only massive bleeding, but other injuries as well, such as blocked airways and penetrating chest wounds. Any victim of a potentially life threatening emergency, should receive Emergency Oxygen. In an emergency, victim’s vital organs and tissues suffer from low oxygen levels, that, if sustained, will lead to brain damage or potentially cardiac arrest. It is important to have Emergency Oxygen onsite to restore oxygen to the victim as quickly as possible. 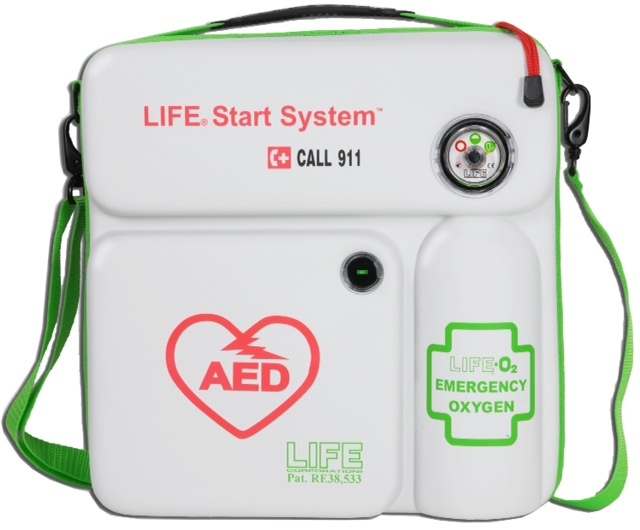 LIFE®SoftPac™ is an ideal light-weight 6 pound portable companion for your AED to provide Emergency Oxygen to a breathing victim before the onset of fibrillation, oxygen enriched CPR to a non-breathing victim, or continued supplemental oxygen after successful defibrillation. It features a constant reading supply gauge with simple full-to-empty symbols, always visible through clear window, knurled-knob On/Off valve prevents accidental opening in transit, shoulder strap, foam handle and padded case for easy carrying with wall-mount hook. LIFE® CPR Mask universally fits adult and child with one-way valve and filter to prevent disease transmission. Disposable/Replaceable (or refillable) cylinder, non-prescription, 40 minute supply @ 6 LPM Fixed-Flow, 6&12 (“Norm” & “High”) for 100% inspired oxygen, and 0 to 25 LPM variable flow for EMT’s. Shipped with cylinder full O2 ready-to-use. 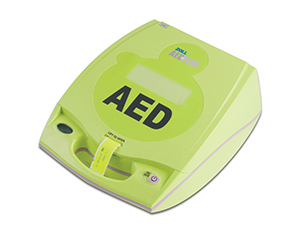 The AED Plus is the first and only automated external defibrillator (AED) that provides Real CPR Help® for depth and rate of chest compressions during CPR. 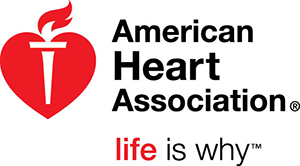 The AED Plus guides rescuers through the complete Chain of Survival helping all sudden cardiac arrest victims, not just those who need a shock. The only thing that should be hard about safety training is the hat your staff wears on the job. Build your OSHA compliant program with the Red Cross. Now offering First Aid/CPR/AED and Bloodborne Pathogens Training. Call 1-800-567-1487 or visit www.redcross.org/safetytraining to learn more. 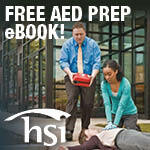 CPR, AED, and first aid training is available in a traditional classroom setting or through blended learning options to deliver the cost-effective training and certification you need for a successful AED program – all managed with Otis Learning Manager™, our easy-to-use online learning management system.